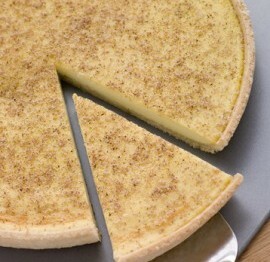 This custard pie recipe has to be one of my favorites. It is creamy, a little sweet and a bit spicy (not hot but lovely with vanilla and a bit of nutmeg. Gather the dough into a thick disk, wrap it in plastic wrap and refrigerate it for at least 1 hour. If the dough is refrigerated longer than 1 hour and becomes firm, let it stand at room temperature for 10 minutes before rolling it out. On a lightly floured surface, roll out the dough into a 1/8 inch thick circle. Fold the circle in half and place it in a 9 inch pie plate. Unfold the dough and fit it into the pie plate. Fold the edges of the dough over the edge of the pan and flute the edges. Freeze for 15 minutes. Position a rack in the centre of the oven and preheat the oven to 400°F. Place the pan on a baking sheet. Line the pan with aluminum foil and fill with pastry weights or raw rice. Bake until the dough looks set, about 12 minutes. Remove from the oven and lift off the foil with the weights. Lightly beat the egg white until frothy. Brush some of the white on the bottom and sides of the pie crust. Bake until the brushed area looks dry, about 3 minutes. 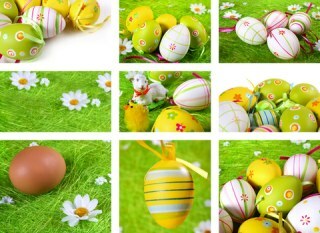 Whisk the 3 whole eggs with the egg yolk, half-and-half, sugar and vanilla. Pour the mixture into the pie shell and sprinkle with the nutmeg. Bake for 10 minutes at 400°F. Reduce the heat to 325°F and continue baking until a knife inserted 1 inch from the center comes out clean, about 35-45 minutes. Transfer the pie to a wire rack and let it cool completely before serving. Because this pie has eggs and cream, store any leftover pie in the refrigerator. The recipe calls for fresh nutmeg and of course that is perfect if you have it. I don’t bake that often, so fresh nutmeg is not something I keep on hand. Simply replace the nutmeg called for in the recipe with an equal amount of jarred pre-grated nutmeg. It will still taste wonderful. This pie recipe is perfect for serving to company but your family – and you – will appreciate it any day of the week. 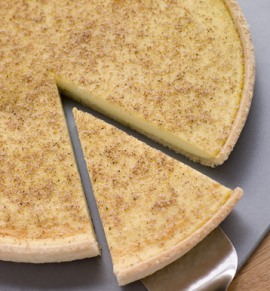 This creamy custard pie is just one of our delicious pie recipes. Find them all here.